Ducks are quacking in Pasadena; Buckeyes have flown across the states to get there as well. Ducks versus Buckeyes. Maybe it’s Buckeyes versus Ducks. Not being one to follow sports, the playing of the Rose Bowl has never meant a thing to me. A bunch of kids go onto a football field trying to hurt one another over a dead pig’s skin. One wonders. I find that just by location, I am forced to decide which team I will support. Do I support the team from my birth state? Do I support my present state’s school from whence most of my friends are graduates? One very good friend was once the Duck mascot. Mind boggling, isn’t it? The last I knew, Woody Hayes was still the coach of the Buckeyes. Don’t be concerned. I still think Vince Lombardi coaches the Packers and Bart Starr is still quarterback. I was married to a sports freak back in those days. Fran Tarkington, Bill Bradley, Joe Namath…..all names that were household words in our home. We lived in Wisconsin at the time. Ray Nitschke of the Packers owned a restaurant in Appleton. Appleton, Wisconsin, was dressed in green and yellow. College football, pro football, all blended together in the mind of this sports mindless person. Rosey Grier knitted and Roger Staubach looked great in his uniform. Football players were taking ballet and turning up in the movies and on the TV screen. A world of football filled our house and only the odd bits and pieces of trivia stayed in my head. Again green and yellow come into my life. I will not sit before the TV screen glued to the game. Well, I might check it once in awhile. Choose a team? I know that those on Neff Road will be cheering on the Buckeyes. I know that most TV’s here in Oregon will be tuned to the Rose Bowl. I refuse to wear a duck bill. I wouldn’t mind having a plate of Buckeye candy. Should I choose? Yes. I have made my decision. A New Year is on the doorstep. I think I’ll go answer the door. Good friends. Yes, they had been good friends all of their lives. Their children grew up together. Every New Years eve they met up once more to remember and to have fun. Mom and Dad’s ‘gang’ were gathering at our house this New Years Eve back in the ‘60’s. We kids were all grown up. Some married. The fire was lit, hot dogs on sticks and the teasing and laughing back in place for another years end. Dad answered the phone. We caught his end of the conversation hearing the concern in his voice. “Gene wants me to meet him at Bub’s.” Garnet had called my cousin, Gene, when Bub didn’t return from the barn. He had been gone for quite awhile. The night was cold and she was very worried. Gene did not want to walk into that barn alone. They at the farm on the corner of Neff Road and Red River-West Grove Road. They found Bub. He had died of a heart attack. Bub was more than a neighbor. Gene and Dad farmed with him. When we worked in the field, Bub and Harold Horner teased me. Working was fun with these men. Now one was gone. Dad came home with the news. The party atmosphere gave way to tears and reminiscing. A friend from their youth was gone. We all felt suddenly older. We children looked at our parents and realized their loss as well as our own as we realized how quickly we could lose one of these wonderful people we loved. Perhaps the closeness of this group became a little deeper that night. Perhaps a new year was begun knowing what was truly important. Never does a New Years Eve arrive that I don’t think of Bub. He was one of the first adult friends of my parents who became mine as well. I was no longer one of Willard’s daughters. I was Pam. It was a cold winter night when my dad and Gene walked into that barn. They walked in with courage and left bearing much pain. We do walk forward with courage thinking we are prepared for whatever lies ahead. The older we get the more pain we bear from what life takes from us. Yet all of what was before has created the ‘we’ we’ve become. I learned a great deal that night. We do survive pain. We do survive change. We work hard at this thing called living. But most of all we hold close to our hearts those we have now and those who have gone before. There is not a moment to lose in this short time we have on this earth. They sat before the fire as friends meeting for one more New Years Eve. They walked out of the house on the first day of the next year holding those friendships dearer. Hold close the moment for too quickly it slips away. During my second year in high school, Willard would take me to his class Sunday school meeting. His folks didn’t want him to date so if we met his mother when we were together, I’d find some place to hide so she wouldn’t know he was with me, generally down on the floor of the back seat of the car. One time Willard and his friend Jim Fourman came to take me and a friend home from a meeting. There was Willard on the back seat so I got in with him. When we pulled in our lane, my dad walked out on the porch. Willard opened the door and pushed me out of the car and Jim gave it the gas. And my dad stood on the porch and really laughed. Said I doubt if that young man comes around very often. I married Willard at the Painter Creek church on November 24, 1936 at 9:30a.m. Roy Honeyman was pastor, Lucy Beane, my maid of honor, Keith Loxley, best man. My dress was royal blue velvet. I am going to write, Lord willing, all about life with the man I’ve always loved and all about my 3 beautiful children. This will be in another book. Mother never wrote that other chapter of her life…..not on paper. Three months after this book was sent Dad would be dying of cancer. I guess we know the next chapter. We knew the parents who loved one another with every part of their beings. Mom and Dad’s love embraced the world that knew them. We lost Mom four years later. In the time without Dad she didn’t seem to grieve. Instead she walked daily with him still beside her. In reality, I do think he stayed until she joined him. Thank you for being part of Mom’s journey, a time in Franklin Township. Our journey to Neff Road. With the eyes of an older woman, I still see through the eyes of a small child the lights and wonder of the Christmas tree, of the fireplace in the basement, lights turned off and Christmas lights surrounding the ceiling warmly lighting the family around the fire. With the voice of a small girl, I stand once more in front of the elderly in the county home singing “Away In The Manger.” Wrinkled hands reach out to touch my blonde curls. I sit on the bench next to my mother and find my harmony in this chorus of family voices. With the ears of a small girl, I hear stories of Christmas’s past, of crops and baking, of local gossip and family catching up across the miles of separation. I hear the sweet voices of neighbors who have been mine for a lifetime. With a small girl’s hands, I place bread on a once lit tree, our yearly gift to the birds. I sit with my father and watch them feast. A flash of red and a cardinal decorates the tree once more. The missing of Neff Road sat heavy on this woman on Christmas day. This woman who will not see a cardinal on the feeder since there are none in Oregon. Of a woman who will no longer sit in the basement, the heat of the fire warming her face as she watches the flames dance across the burning logs. She weeps for those who are gone and those far away. Her voice no longer sings with the same clear tones. And she is the one with the wrinkled hands. I am no longer on Neff Road. Yet Neff Road is found in the sitting by the fire with my grandchildren reading books and watching the flames dance across a Duraflame log. “Can we sing Christmas songs after Christmas?” Syd asks. Of course, we can. I’ll sing them with you all year if you wish. Yesterday I sat by the bed of my friend who has MS. Her Christmas was spent in her bed unable to move but a few fingers. I meet her new roommate who has been fighting a losing battle with cancer. A wrinkled hand holds another of the same as I lay my cheek on the brow of my friend. Neff Road runs right through the middle of my house. It is in what I pass on, in what I share, in who I am. For you who live there still, you are blessed. And, you live next door to my heart that resides there still. The lights warmly glowed lighting the room full of packages and people. Not many Christmas’s found us all back on the farm. But this Christmas was full of magic. We drove back to the farm from Wisconsin, a hassle with a baby, Christmas gifts and luggage. If I remember, the weather was nasty as well. But we would all be home for Christmas. Young cousins bubbling with excitement opened packages as the sisters and husbands looked on. Mom and Dad had the best present ever. Their daughters were all home at the same time. A new little one added excitement to the season. We were all tired from of traveling, but the trip was worth it. Dad had an especially beautiful tree that year. The old bubble lights captured the attention of the little ones. The kids separated by miles were best friends once more. Sisters living in different states once more caught up and reminisced. Mom cooked up a storm loving her time in the kitchen with someone always sitting at her table. Dad enjoyed visiting. Neighbors stopped in to see the Loxley girls and the Johnson’s came to celebrate. Mom ended up at the piano, and we sang together as we had in years before. I wish I could go back and capture that time. I wish that many of those people who are gone now would be with us once more. Miles still separate the Loxley girls. We will probably never have another Christmas together. We have not had our families all together since the children were young. I wonder if other families feel the loss as much as do we girls. The miles and years that have separated us have truly drawn us closer in heart. It was a special Christmas. I didn’t know it back then what I possessed. It was the gift of family together, a rarity of a life away from those who share my past. Each day I am thankful for my sisters. They share a bond with me which neither my children nor my grandchildren will understand. It was Christmas on the farm…..it was family. Thank you for daily visiting the farm with me. Hold close those you love and cherish this Christmas together. My love and Christmas blessings to you. With Christmas on the doorstep, I will take a break from Mom's diary. Yesterday I was visited by my granddaughters. I'm teaching them to play the piano. They pulled out the pile of Christmas music and asked if I would play the songs they chose. We sang together as they watched my hands play across the keyboard. As I have said in the past, the family always sang around the piano. Some of my dearest memories are of a family raising voices in beautiful harmony. I never knew a time without music. Mom's blonde-colored piano was her treasure. It must have been a huge financial drain on their budget. Perhaps that made it more special. My grandparents on both sides had old, clunky pianos with yellowed, ivory keys. Grandad's piano was once a player piano. The old rolls were gone by the time I came along. Pianos were a part of many households. They entertained long before the radio and TV came into existence. Children of all ages found their way to Mom’s piano. Little fingers would feel the joy of pushing the keys down and finding new sounds with each stroke. Mom would never have considered closing the keyboard. Youth from the church or friends of my sisters would stand around the piano as Mother played singing songs and laughing. The piano was probably the most important piece of furniture in that house on Neff Road. A piano was one of the most important pieces of furniture that we bought as newlyweds. I don't think I probably considered what a gift it was that I had a husband who wanted me to have my new Everett Piano. It traveled with us to Wisconsin then to Oregon. Still my prized possession. As babies, my children would stand at the piano with fingers barely able to touch the top of the keys. Sooner or later, I would make my way to the piano, pulling them up on the bench playing simple songs they loved. Sometimes we would sit on that same bench singing songs before the went off to school. However, as they grew up, singing at the piano was not something they wanted to do. A family tradition had taken a holiday. Much of the old sheet music is held together with stitching along the side of the music. The music is tattered and worn some as old as the early 1900's. Some of the old Christmas music was Mom's. Silver Bells, White Christmas, Let's Light the Christmas Tree and more sit on the piano each year. "Can we sing more?" my granddaughter asks. Santa Claus is Coming to Town is placed in front me and my fingers play music box notes. My aging voice and two sweet voices sing at the top of our lungs. Music and laughter. Maybe the tradition will continue. The girls both want pianos some day. Mom would be thrilled. For me, the day we stop singing together is a sad day, a day of losing something that once was very special and a part of a thing we called family there on Neff Road. My folks always raised a lot of tobacco 17 acres and it seemed to me we worked in tobacco all year. We would strip tobacco in the fall then at Christmas time we would clean up the strip house and my dad would get Uncle Dan and Aunt Julie to help and we would butcher 9 hogs every year. We would can meat for a couple of weeks after we butchered. We would take the tenderloins and butterfly them and the sausage and put a layer of lard, then a layer of meat and do that till the crock was full. I don't believe we ever ate a meal without meat on the table. Brother Bob liked school. And Iva was a good scholar made very good grades, took a test after 8th grade and passed the Boxwell test. If you passed the test you were able to teach. She never wanted to teach so she did house work for several families. Bessie hated school and goofed off all the time and claimed she didn’t need an education. Bob and Iva would try to help her at home and she would really get mad. She made such poor grades she quit school in the 7th grade. Pop always said Iva was too good a girl for any boy in the neighborhood, and he would never let her date. So I remember in my first years of school, knowing that Iva would crawl out her bedroom window and meet guys. After Pop found out, he told her she could have dates. I was about 4 or 5 years old then and when a guy came in to see her, I would go crawl on his lap and tell him I like him. My mother would come and get me. And Iva would say keep that kid in the kitchen. Ah, my family. They were a bunch of characters. It was another time. Red River was a thriving town. School houses were one room. 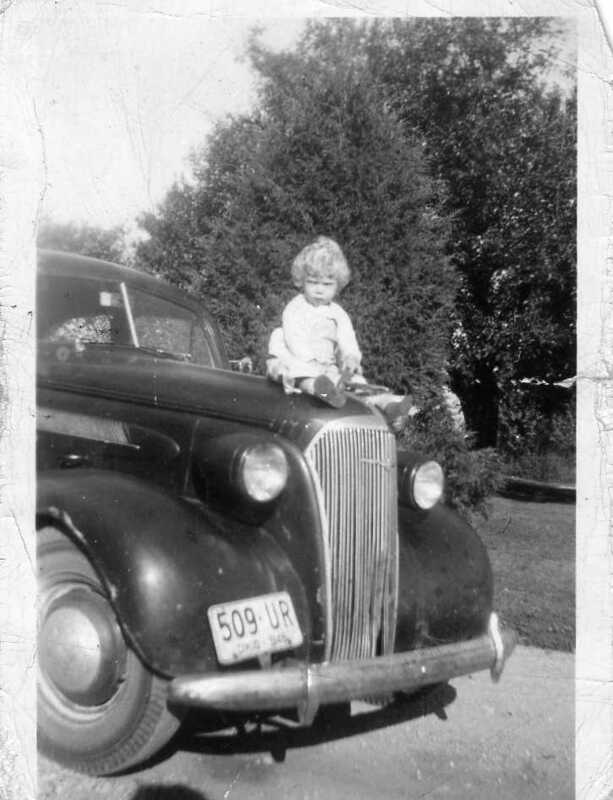 Cars were new to the scene. The gap between mom and her siblings was huge. I sometimes wonder that she found her way into the Loxley family…..I’m glad she did. Willard, the boy she would marry, comes into the picture. When I was 10 yrs old, Willard and his mother would go past our house and take eggs to Bradford to ship to New York, to Stern and Tettlebomb, and I said to Mom, “I’m going to marry that boy some day.” And she said, “You’ll change your mind a dozen times.” Willard’s folks had chickens and got 9 cases of eggs a day. Willard had to work hard at an early age. Bob took his junior and senior classes all in one year. I remember one of the teachers came and would help him with his lessons, then the teacher stayed all night. His name was Slonaker. After he graduated, he got a job on the railroad. It had come to Bradford and their was a lot of jobs available. After the railroad come to Bradford, the one grocery store, the post office and the sawmill left Red River, so we didn’t live near a town any more. My mother’s world was so different from my own. I miss having the stories come from her instead of in a diary. I wish I had seen Red River in its glory days. Perhaps it makes me more aware of telling my story. I hope you don’t mind sharing the journey from the past. And music came into Mom’s life and the life of her children. When I was 9 years old, I started taking music lessons of my sister Iva. Our family all liked music and we’d all gather round the piano and sing a lot. My brother Bob had a cornet and he and Iva played for church at Christian Beech Grove Church for services. Bessie could play the piano by ear, and could play anything Iva played. I was playing for them to sing at Red River School by the time I was in the 4th grade and I played all thru grade school. We didn’t have a music teacher when I went to high school, but Superintendent Dalton Hill would take each class 3 times a week to the gym and teach them songs. And I played the piano. I get out of a lot of classes when I went to Red River to school. Allan Puterbaugh was my first teacher and he loved to draw my picture on the blackboard. There was 5 in my 1st grade. My second grade teacher was Orville Lawrence. He was a good teacher and he would always go out at recess with all of us and play games like Handy Over. A girl in the same class had to walk a mile and a half to school, and in the really cold weather, she would stop and warm at our house then we’d walk on to school. A step back again in time. Thank you for joining me. I apologize for the spotty blogs this week. It will probably be this way until after the wedding in Jan. I will do my best. Friday I will not be writing. I cut my upper lip in two cutting a doll dress with a knife. Took 5 stitches to sew it up. My mother too me to Dr. Buell and he said He would have to sew it in my mouth or I’d have big bumps around my lips. I did good in school and hated to miss any but in the 3rd grade I was riding Edward Young’s bicycle home as I always went home at noon from school to eat dinner. And I was going pretty fast and fell of the bicycle and hurt my knee. It got infection in it and I had 23 boils on my right leg around my knee and couldn’t go to school for 3 weeks. The teacher boarded with Bob and Welma and she come with m lesson every evening. When I was 9 years old I helped my dad make hay in the fall before school started. 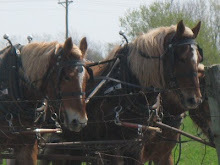 He would hitch the hay up on the wagon and I would tramp it down. Our back field was a half mile back and one day my dad took the load up to the barn to unload and when he pulled up to the barn I wasn’t on the load. So he unhitched the horse and rode it back to the field to find me. I fell off when he turned into the lane and I was unconscious. He put me on the horse and we went to the house. He went for the doctor, riding the horse to Gettsyburg. The doctor came and said I had a sunstroke and I couldn’t get in the sun for 3 months. School started and I had to stay home all thru September and October. I still remember how hard it was for me to see my friends walk past our house and I had to stay home. Anyone who knew my mom can well understand the woman from these things that happened to her as a child. I wonder just how much she really went to school! Ah, Mom, you were a livewire, a girl who later in her life would add her energy to Neff Road. My sister Iva was 16 yrs. old when I was born. Robert B. was 12 yrs. old and Bessie May was 10. When I was growing up, the families got together nearly every Sunday. Aunt Julie and Uncle Dan lived just 1/2 mile away. Raymond and Ralph, their sons, were the same age as Iva and Robert and they always were carrying me around. One thing I remember, and was very small. My folks went to church and Ray Eberwein stayed with me as I was sick, and before the girls went, they put a curling iron in a kerosene light in their room upstairs, and after everyone had gone, Ray smelled smoke, and he carried me upstairs, and the curtain had caught fire. (Wow, Mom, that’s one long sentence) He put me in the kitchen, shut the doors and run back upstairs. I screamed and kicked, and I always remember it. When I was 4 yrs. old, we were cutting tobacco. My dad raised 17 acres. Bob scolded me for something while we were in the field. I bet I had it coming. So I run off. When they got thru with the tobacco and went in the house for supper, I couldn’t be found. It began to get dark, and they (my folks) had all the neighbors looking for me. At 9 o’clock p.m., Bob found me sound asleep in the corn field. My dad and mom were patriotic, and it was always important on July 4th to hang our big flag on the porch. My dad run for sheriff one year when I was small, and on voting day everyone in the neighborhood came and stayed till the votes were counted in Greenville. He lost by 4 votes. My mother and dad were very much Republican. I remember a couple of weeks before election my folks would not go and visit Uncle Dan and Aunt Julie as they were Democrats and they didn’t want to argue with them. After the election they were oke again. So, Mom’s story will continue tomorrow. I hope you join us. My mother has been gone for several years now. Yet every year on December 14 her daughters remember that cold day in December when she died. On my birthday in 1996, the year we lost my father, Mom gave sent a journal to me that was to be one of two. The second was never written. I want to share her memories with you. It is a story of another day and age, of a young Ruth who was different than the woman most knew. It was a time of children losing parents and parents losing babies. The events that lead partially to the woman I am began on the other side of the block from Neff Road. It began in 1912. This is not a diary as I tried to jot down happenings. I was having a hard time writing. So I decided as things popped into my mind then I would write it as I remembered it. Some of it might be hard to piece together. I was told it was a very hot day and on my Pop and Mom's 58 acre farm near Red River, Ohio, I was born. The neighbors were there threshing wheat. The whole neighborhood always said to me, “I saw you the day you was born.” I never asked whether they dressed me before they showed me to everyone. Perhaps not! My father is John Johnson, son of James S. and Paralee Langston Johnson, my grandmother. She died of blood poison before I was born. James S. died of old age. My mother was Mettie Salley Besecker and her father was George Besecker who died when my mother was 4 years old. He liked his liquor to well. My grandmother Sara Steffy (Ernest, 2nd marriage) and my mother’s 2 sisters, Julie Eberwein, Pearl Kreider, her brother Clarence Besecker lived all their childhood with 3 bachelor uncles at Painter Creek, John, David and Mose Steffy. I loved to go to Steffy’s. Their the only ones I knew who took a newspaper with comics. I’m sure I was terribly spoiled as two years before I was born my parents lost a little boy. His name was Emerson and died of meningitis at six months. My Aunt Pearl had two children to die soon after. Aunt Pearl was like a 2nd mother to me always keeping me and buying me things. At Christmas a huge tree sat in the center circle. Light poles were decorated and stores took on the holiday season with swags of evergreen, and windows filled with glass balls and little trees. The palace was full of stylish winter clothing. On the top floor Santa waited for me to tell him my Christmas wishes. I wanted the little blonde doll that resided in a box on the table nearby. She looked like an angel. Fourman’s had dapper suits and hats for men. Most men wore hats back then as did the women. The men shopped on one side of the street for their hats and the women on the other side at the millinery shop. Bonfiglios was full of Christmas decorations and beautiful cards. We lingered by the shelves adding items to our wish lists. The 5 and 10’s coveted our money offering everything from hosiery to work gloves for Mom and Dad. Bins of candy and comic books for my sisters. Garth’s Museum was decorated for the season with special displays. Room after room reminded us of our roots with pride and panache. While the city park, covered with snow took us to a winter wonderland. It was Greenville at holiday time. Best of all was walking down the streets into the stores meeting people who stopped to chat. Stories were exchanged as well as Christmas wishes. We were all neighbors in Greenville. Store owners knew our names, and once in awhile a candy treat was handed to a small child. It was our town. The lights will be down when I go home again next spring. The tinsel in boxes and winter replaced by a new season. For the small girl who once lived there, she will still hear the carols and meet old friends. Forecast for Portland, Oregon: Ice and snow coming in Friday night, leaving on Sunday. Hm. Guess I’d better go get some food, just in case. Maybe I should grab a log or two in case power goes out. What will I do without a TV and computer? Another, hm. Wow, not nearly as exciting as ‘no power’ on the farm or when my kids were here, and we were electricless. When the power went out on the farm, we moved to the basement. The fireplace would keep us toasty and offered a wonderful place to roast hot dogs. Mom always had chips and dip on hand, hot dogs and buns, and, at this time of the year, nuts and popcorn balls. It was an event. The gravel on the lane wore an icy coat that offered no traction yet Dad would bundle up and hop up on the tractor with the lift on the front and a chain on the back. Neighbors would have clean driveways and cars would be pulled from the ditch. Food could be brought in to neighbors, rides given to stranded travelers and Dad having a blast doing it all. When my kids were growing up, we loved the ‘powerless’ time when games were played, the fireplace roaring and boredom was replaced with creativity. We really weren’t powerless. Rarely does the power go off here in Oregon. If it does, I will find myself bundled with a fire roaring and a good book or two in hand. Perhaps even a few new stories will adventure into my head. Being without power reminds us of a time when there was no electricity, when lives were simpler and more of a struggle. We reach back in time to make do with what we have available. We are not powerless. Maybe we are a bit spoiled. I miss seeing Dad ride off on that tractor with a big smile on his face, and his return with the stories of his adventure. I miss seeing Doris walking into the house from a hike up the lane to visit neighbors. Red cheeks and bundled head to toe, she joined us by the fire. I miss the silence that accompanies a world without power. I wonder if I should pick up some chips and dip. Can I roast hot dogs over a Duraflame log? Ah, solitaire and books. I’ll be just fine. Maybe it was the day and age. I'm not sure. Maybe when I opened a Christmas gift from my husband finding a food processor, was also a holdover from another day and age. But there I sat with Dad and a pile of red towels. Never did I see our parents exchange gifts for any occasion. On this Christmas, Mom must have asked for red towels, otherwise, I'm sure Dad would not have known. Bath towels, hand towels, wash cloths all matching and waiting to be wrapped. Mom was gone when Dad and I sat before the gifts, paper and tape. I sat in the middle of the living room when Dad pulled out the towels. He probably had been hiding them in the barn. Along with the towels came a new, enameled canning pot along with a new roasting pan. He had the great idea of making this present fun for Mom. We rolled towels packing them into the pans then placed the pans into boxes. Dad held the paper while I taped. It was an odd time for my father and I. Never had we done anything like this, preparing something special for Mom. Perhaps that is why it has lingered in my overcrowded brain. We sat around the tree Christmas morning. I could hardly wait for Dad to bring in his packages. Mom was totally surprised to receive these gifts from Dad. Boxes opened, oooohs and aaaaahs over the new pans and delight at the discovery of new towels. I can’t say that I was that excited about my food processor. But we didn’t have much on the farm. Pretty new towels were a luxury. Mother’s love of red was satisfied in her new towels. Dad was a bit more admired by his little girl. And I later in life bought a red sofa. Memories just might come in a canning pot or in the color red. Memories might come in the shape of a gift from a Dad to a Mother. Whatever we set before a child is a lesson. Mine came in the color red. "Why call the blog Neff Road," she asked. Well, I had tried to register other domain names, but they were taken. Neff Road seemed all that remained relating to 'home'. Now I know that this domain name was meant for me. 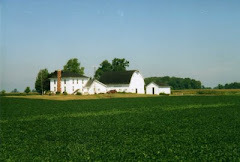 "Neff Road has become more than memories of my family and the farm. It has become a story of my community, friends, church. A story of the 1940's through 2009. It is a story of all of us. Perhaps even of a day and age that many have forgotten and some remember but lack words to share. Neff Road has a life of it's own. I am the recorder," I answered. When I was home last year, didn’t think I would drive past the farm. My close neighbors were no longer there. My childhood home had been changed, the old barn torn down. I did not want visions of the present ruining the memories of the past. Yet, on the last day in Ohio my car turned down Neff Road. The car crossed the bridge, my eyes glued to the road looked to the north. I smiled seeing the farm alive again. The changes reflected the young couple who made it their home. Babies once more cried and families gathered. Neff Road holds the spirits of those of us who lived there. It holds an energy called love that bound us together. The old gravel road was paved time and time again much like the houses that change occupants. All things change. I love writing this piece of Americana. Each time I write I find more pieces of me. I thank you for joining me day after day on another walk down that old road. A road that was once only a path, a path to memories. What Christmas present do you most remember? Mine? I remember a Christmas morning when I was surely no more than three. I walked down the enclosed stairway into what was then our dining room. In the corner of the room by the window was the most beautiful sight I’d ever seen. A small, grey canvas baby carriage just like the big ones was turned away concealing the contents. Peeking over the side of the baby buggy was a soft, yellow flannel blanket trimmed with blue. The carriage was just the right height for this little girl. I remember it well. I held my breath as I looked inside. Amosandra was dressed in a flannel gown with matching cap made for her by my mother. She was the most beautiful baby I’d ever seen. The little doll slept with me every day from that day forward. She traveled to Washington DC, visited my aunt in Michigan, comforted me when I was ill and resided in my room until dolls were replaced by other interests. Her name was Amosandra. I know because it was embossed at the back of her little head. I don’t remember ever seeing her before that Christmas morning. I guess she was meant to be my baby. It wasn’t until I was grown that I realized my favorite doll’s mother was white. “I wish you were here, Pamela, then you could play with him and pick up all the toys he throws away,” it read. Deiederihfe was a beautiful baby with white-blonde curls and a big smile. 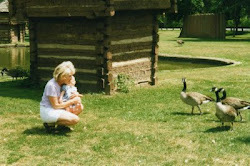 I didn't have much experience with babies even though Mom often babysat. But I was mesmerized by this big, beautiful, Dutch baby. He would drop a toy. I would pick it up time and time again. It was a game he loved, and one I was willing to play. Uncle Phil contacted Mom about a family that was coming to the US from The Netherlands. The father, Hans, was going to be working with Uncle Phil. His wife and baby boy needed a place to stay. Of course, as usual, Mother opened her arms and our house to these travelers. Wilhemina introduced her country to this Neff Road home. She became part of our family chatting like an old friend, helping Mom in the kitchen and telling us of her home far away. “On the other side of the card you see the bulb fields in Holland. Perhaps you have it so too a little bit next year. We hope that they will grow in Arcanum.” The row of tulips ran down the side of the old garden. Every year they bloomed and reminded us of the woman who sent them. 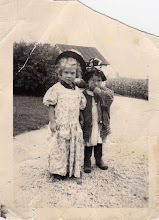 When she first came to our house, she brought to me a pretty handkerchief with a Dutch boy and girl embroidered in the corner, a chocolate orange and a beautiful pin when opened displayed pictures of Holland. A world beyond came to our house, and I grew. We lost track of the Hubenauts. Sven joined their family a few years later and much later the Hubenauts were divorced. I think of them often and have even tried to find online that once darling baby now grown man. Amazing how a visit can change the world of a child. Every Christmas I pull out the card I received from Wilhemina in 1955. I was eight when I when it made the trip across the Pond. Greetings from Holland. Fifty-two years later, I remember that time appreciating the experience that made my world a bit bigger. Zalig Kerstfeast, my friends. Zalig Kerstfeast. Long before I had heard of Dr. Seuss, I had seen a lumpy character with funny feet and a funny name. It was a phoose goose. Perhaps you’ve not seen this silly character. I’m sorry for you are missing a friend, one I’ve had for years. Aunt Esther did a fine thing when she agreed to marry Uncle Phil. She got the man, and I got an uncle who is a favorite his niece. This tall man was a college professor, yet he had time to draw this funny phoose goose for his niece and to continue to make her smile even into her adulthood. My dear Uncle Phil. Their Volkswagen was one of the first we had ever seen. Mother and Dad would laugh at Uncle Phil unfolding himself from the tiny car. It was only one of many things introduced to the Neff Road girls by this intelligent, witty man and equally wonderful woman. I don’t know how little I was when I had my first phoose goose drawing. I prized it as I would an original Van Gogh or Charles Shultz. The quirkiness that was Uncle Phil was in the drawing as well. Even now I smile wishing I had one large phoose goose to hang on my wall. I could introduce it as a family member. Aunt Esther and Uncle Phil opened doors of adventure and new thought to me. Uncle Phil was an astronomer offering me glimpses of a sky much more mystical than the one my little eyes could see. He and Aunt Esther were inquisitive and delighted in searching for wonderful rocks and enjoying birds. Their appreciation of nature only drew me closer to them. We shared the excitement of discovering treasures from the earth much as Uncle Phil had found the treasures in the sky. Later, I would walk with my children on the Oregon Coast looking for fossil shells and sometimes even a fossil bone would appear. When my aunt and uncle came to visit, we scoured the countryside for new discoveries. Christmas gatherings at Grandad’s always left me with a feeling of being on the outside looking in. Uncle Phil always found me. He teased the laughter from me and delighted me with his drawing. He recognized a small, shy girl who didn’t know how to come out of her shell. He crawled into that shell with me and asked if I would come out and play. It was fine adventure growing up with this aunt and uncle of mine. They hold a place in my heart where those who have taught me to laugh and to learn reside. Even though they live far away, I have only to look in my heart to find them. I am, in part, who I am because they came home to visit Neff Road. I am one of a kind like the phoose goose. Dad retrieved the nutcracker and picks from the drawer. The familiar crack would sound. It was official. Christmas season was here. One of my first memories of the holidays is the basket full of nuts that showed up every winter. Some years Dad would gather walnuts nuts to add to the mix. We all had our favorites. I loved the walnuts and had not yet learned that I would favor pecans at a later time. As a little child, I would pick out the different nuts studying their shells. Dad would crack them giving me a taste. I don't think a peanut ever crossed the edge of that basket. Evidently, they didn't have enough class. It was Thanksgiving, "Mom, can you bring over the nut cracker?" my son asked. Of course, I would say 'yes' even though it meant that my basket of nuts would have no nutcracker. I apologized to the walnuts and took the utensil to my son. He remembered. He remembered another time. Somewhere in my busy brain, I seem to remember my Grandad Loxley having a nut basket (for lack of a better term). Mostly, I remember the ripe olives that I would sneak reaching up over the side of the table. Again, another must at Christmas. I wonder where these traditions began. 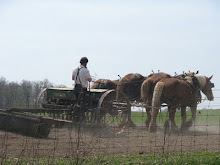 Were the nuts a carryover from old England, pioneer days? Are they a symbol of another time when the fruit of the trees was a prized treat? I don't think the Johnson's ever had nut baskets; however, I do think Uncle Keith Loxley had one as well. Perhaps it was just a part of a family winter ritual. I smile that my son has a basket of walnuts in his new condo with his soon to be bride. Perhaps he, too, is the family storyteller. Whatever it is, he now has the nutcracker.....I'm using a hammer. It hung in the corner of the barn all covered with dust and cobwebs. Boards were broken and held together with wire. The knot tied to it was knotted by my father's hands. Dad and I walked through the barn. Remembering other days and learning new stories. We stepped into the milk stable. "That's my old sled," he said pointing to the greyed sled hanging in the corner. "I got it for Christmas." He shared stories of the Loxley boys sledding trying out the new sled, the same sled we children rode down the hill at home. It now stands in the corner of my living room. Following is a piece I wrote in memory of that day with my father in the barn. It was my father’s sled. There. There in the corner. Ages old and weather worn now a remnant of the past, a remnant of my father. Too soon the earth captures her own holding to her bosom the babe who played in her leaves, who fished in her ponds, who loved her earth, who fed and nourished the very soil of her cloak, who saw his own returned to her loving arms. Death, you are a blackness that comes quickly when least expected, silently, hidden until the final assault. Your vengeance is cruel, your methods immoral. Yet you will not leave your throne until all have tasted your sword. Your shadow encompasses all who pass too closely. You, the victor over all who taste your wrath. But you cannot take away. You cannot erase the moments, the memories of the mortal soul. Listen. Hear the laughter of a small boy running to meet the first winter snow, running to try his new sled sitting on golden planks atop freshly waxed runners. His face is red, so bundled he can hardly run. Yet he laughs dashing to try his new Red Flyer. Listen. No darkness. Only memory. In the corner sits that once new toy. Now the runners rusted, the lumber grey. Here and there broken pieces held together with wire and dowel. Each scar a memory of a young boy’s adventures. A fairly new rope knotted by old, gnarled hands readied the craft for another pair of small hands. A small child eager to meet the first snow. It is a fine, old sled that once, when new, held a fine young boy. The plastic bell hangs from the worn, black thread. When shaken, the sound is more a thud than a ring. The red plastic has dulled. This bell once new hung on a tree in Ohio. Again, December had arrived. Dad lifted me to put the blue angel on the tree. Every year we debated whether to hang the star or the angel. The angel with spun-glass hair was always my favorite. I was hypnotized by the bubble lights. We draped icicles one by one over the limbs. Decorating the tree was a ritual....and a memory. I would work on the lights while they made cards for our ornaments we would give out daily. Before I knew it, small hands were passing the lights around the tree. "Do you want me to help hang ornaments so you can get done faster?" I asked. "No," answered Sydney. “I want to know the history of each one.” Another 'wow'. Sydney would be the keeper of the memories. “Can we string popcorn and cranberries like we did last year,” she asked. Well, if I remember rightly, last year we had popcorn everywhere and the girls gave up the effort after about 2 ‘ of stringing. “Of course, we can,” I answered without hesitation. A plastic bell hangs on the tree. A bell hung on a tree by my hand….the hand of a small child. The bell holds new memories for Sydney to take through life and holds memories of the trees on the farm on Neff Road. “Did you know that an angel gets its wings when a bell rings?” asked Gabby. Ah, yes, they had seen ‘It’s A Wonderful Life’. In heels and dresses, we clung to the tractor fenders literally for our lives. We knew we could tolerate the cold for the miles it would take to get us home. Little did Shirley and I know that when we left for work in Dayton that morning, we would be struggling to make our way back again. It was 1966. I was working at NCR and made the daily trip to work with my friend, Shirley, carpooling with Doyle. Now riding with Doyle was a challenge on a good day, but carpooling saved money. Shirley and I would meet Doyle at my fiance's house. The weather began to change around 3pm. Our bosses decided to send home those of us who commuted. Icy roads continued to worsen as we headed north. We were near Phillipsburg when night descended and the roads became impassable. Doyle turned the car into the lane of the nearest home. The house was full of people. Strangers, such as us, who could drive no farther were welcomed by these residence of this home. We knew we didn't want to spend the night here in this mass of humanity. Doyle had headed out on his own. Had we gone with him, the chances were good we would be stranded. I called Gary's parents, and before long, a tractor pulled into the lane. The Miller's had called their neighbor who came to gather two worried girls. In high heels and dresses, we climbed onto the tractor. Shirley and I clung onto the sides for dear life as the tractor made its way to Jenny and Marvin's home. The warm house and warm arms greeted us. We were with family. With nothing more than purses and the clothes on our backs, Jenny found clothing for both of us, feed us and took us in as her own. The trip home from work took two day. Two days that created a small family talking of the boys we loved in Nam, playing games and enjoying the companionship. I often think of that day. I'm not sure my bones ever thawed out from that tractor ride, but my heart warmed by those two days with people who were very dear to me. Sometimes what seems to be a long trip home can end up being a trip 'home'. She sits on the chest, hair pulled up high on her head and metal earrings in dangling at the sides of her face on tiny earlobes. Her mahogany face never smiles. She is beautiful. In dividing up the things at the farm, we girls seemed drawn to different items. Once in awhile we couldn't find some item that we had grown up with deciding that Mom had given it to someone along the way. The mirrored back to the sideboard in the basement was missing. Mother had at one time used it at a shelf. Where was it now? Once in awhile we would debate the origin of items that had not accompanied us through our years on the farm. One such item was a picture of natives on boats that mother had hanging in the bathroom. It was in a beige, pressed board frame, circa 1960. I brought the painting back home taking it to be cleaned and framed. A beautiful picture appeared now hanging in my living room. The source of the painting? We don't know. Another such item was this beautiful bust of a native woman. My sisters shook their heads when I asked to keep it. I have a passion for dolls of different colors, and I could not stand to think her going to a home where her roots were not known. Okay, I know that I didn't know either, but she had meant something to Mother or she wouldn't be on her bookshelf. I unpacked the items from Ohio when they finally arrived in Oregon. My children saw the bust and they, too, shook their heads. I'm good for lots of head shaking. This lovely, nameless woman resides with me. The little girls shake their heads and say, "Oh, Grammy." I would like to tell them her history but can only tell them that she means a great deal to me, she belonged to my mother. She was carved by someone in another part of the world, and she is in my care. I don't know where these items originated, but they came to my parents who held on to them for the memory of the giver. I hold on to them for the memory of my parents and for the carver who took a piece of wood creating a beautiful woman and the artist who picked up a paint brush creating the art on my wall. She sits idly gathering dust sometimes and at other times looking up at me as I ask once more, "Who were you." A silent reply comes to me, "I am a gift." Tools, old oil cans, rags, a work bench and the old outhouse all resided in the little garage next to the corn crib. The old dirt floor only added to the ambiance of the old building and the dread we felt upon entering it. The old three-holer sat concealed in the back corner of the garage. Many times Dad would accompany his daughters to the privy puttering in the garage while we spent time in the corner. All of us hated this little privy in the corner with no light. Mice had a small community that lived in the garage so more times than not a mouse would cross your path either going in or coming out of the garage. Years later, Stagers put in a bathroom. 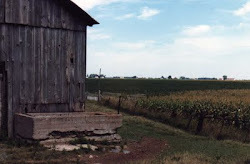 When they moved their outhouse, it ended up behind our corncrib and became our 'new' outhouse. Fewer mice but a bit colder in the winter. Not as cold as Aunt Bess’s on Lake Hamilin, Michigan. We never understood why our grandparents both had indoor bathrooms, and we did not. I'm sure it was a financial decision. In looking back, I feel sorry for my sisters who brought friends home from college. For some reason, I didn't think much about it then. We had what we had. I think I was in junior high when Mom and Dad finally put a bathroom in the basement. It was the pride of the Loxley household. I look at those days of the outhouse as days of bonding. Someone always went out with me when I was little. We walked and talked. Dad and I looked at the sky. June probably tried to hold the door shut on me. After Dad tore down the old garage, I cheered for the erasure of those days of dodging mice. Looking back I realize that we were not behind the times. Hey, we had an indoor outhouse. Not bad. LJL, thank you for reminding me of the little babies in a blanket that my mother, too, made for her little girls. Now I need to get one of my son's hankies, so I can make one for my granddaughters to see. I think Mom also made babies in a cradle. Not sure if this was the same as the babies in a blanket. Coincidentally, yesterday I received an email with an article about aprons. Wow, did that bring back the memories! Mother, along with the other moms, aunts and grandmothers, all wore aprons when I was a child. I remember standing in Mom Johnson's kitchen cooking around the big oak table that demanded its space in the middle of the room. Aprons hung by the backroom door (along with the bonnets) where everyone could grab one and set to the task of cooking. Aunt Welma, Mom J. and Mother, in uniform, moved to an invisibly choreographed dance, cooking, preparing the table and never once running into one another. I was small enough to smell the wonderful aromas that filled those aprons. The article brought up the fact that aprons were probably worn to protect one of the few dresses that women owned back then. We didn't do laundry often and had few pieces of clothing. I don't know if we did the 'sniff and wear' test, but I know that we did wear clothing longer than one day. It went along with the bathes taken less than every day. That's another topic. So Mom in her apron protected a dress, and gave me visions of home. Aprons were used as hot pad holders when transporting a pie from stove to table. They could carry produce from the garden to the kitchen. An apron was a great rag to wave spooking an escapee cow back to the barnyard. A few eggs could be carried in an apron as well as a few precious morels. Tears could be erased, hands dried, a warm handle on a pan grasped by a hand protected by an apron. When I was married, I bought pretty, crisp aprons for the servers to wear. Pretty aprons that couldn't catch a spill much less dry a tear. My mother had several of these aprons as well from weddings past. If I suggested to my future daughter-in-law that we buy aprons for servers, her reply would be, "What servers? Aprons!?!?!" Yes, the wedding apron has gone by the wayside along with doilies, embroidered pillow cases and, yes, the handkerchief. I purchased old aprons at estate sales for my granddaughters to wear when painting. My son has an apron for cooking over the grill. I have an apron for cooking in the closet (not really cooking in the closet but hanging in the closet for cooking) Hm. I don't like to cook. I don't use the apron. I made my first apron in 4-H about 55 years ago. I packed it around for years before deciding I would never wear it again. It was white with black polka dots and pockets across the front handy for toting kitchen utensils and envelopes when I went for the mail. For the life of me, I can't remember anything ever finding its way to the apron pockets. The saying "tied to the apron strings" is no longer valid. Evidently we have become tidier cooks no longer of using these pieces of cloth. The tenderness of a mother's touch wiping a brow or drying a tear with her apron is gone. The smell of the kitchen no longer lies hidden in the cloth. But the memories of the women in my family wearing a well-worn apron, tied in back with a neat bow continues to bring a smile to my face and abundant memories. I guess I am still tied to the apron strings. "Do you have a hankie?" Mom asked. Wow, we don't say that any more, do we? Now we carry a kleenex that usually is forgotten and found later in wet pieces of clothing in the washer. A handkerchief was important back then. Every man and woman carried one. Aunt Welma tatted around edges hers; Mom crocheted. Each were pieces of artwork. Many were given as gifts. I remember Mom and Dad tying a few coins in the corner of a hankie, so I wouldn't lose my lunch money or money for the offering plate at Sunday school. Sometimes I would sneak a finger into the knotted part and make a puppet out of the cloth. Hankies became bonnets and diapers for my dolls. Handkerchiefs. Dad carried huge hankies that his daughters sometimes used as head bands or scarves. We could become a pirate with a red bandana or a lovely peasant girl covering her curls. The number of hankies I ironed on Neff Road would be staggering. Yet they were the best part of the piles of articles we iron back then. The crisp, freshly-ironed smell of a handkerchief was memorable. A smell of home. I carried a lace edge hankie when I was married at Painter Creek Church. I'm not sure where it was tucked, but it came in handy on that sweltering hot day. A handkerchief held tears of happiness and those of pain. It became a puppet for a little one when the time sitting on a pew became intolerable. It held coins, it wiped noses, it dried tears and held a memory of the woman who edged it. I miss the day of the handkerchief, the tender touch of loving parent tending to their little girl. I think we've lost something when hankies became obsolete. Something that brought home a simple loving touch. Wild turkeys now roam the countryside where once they were hunted and gone. The idea of hunting a turkey was about ancient to me as growing maize. It was a time of pilgrims and simplicity of life. Dad found our turkey looking much like a chicken only a few steps from the house. The door would open and squeals of happiness erupted. Another Loxley girl was home for the holiday. Dad watched the lane for hours hoping to get the first glimpse of a daughter returning home. We didn't gather often enough. Many times one of us couldn't make it back for one reason or another. Yet this coming home is still something we cherish when we see each other again. We were greeted with smells of Mom's baking and cooking. Pies sat in a row on the freezer in the garage. She tried to make our favorite pies. Mine was certainly shoo fly pie. We all loved her cream pies and pumpkin. The house was clean but Mom didn't spend time fussing on the house. She fussed in the kitchen and we reaped the benefits. Our children once more became reacquainted tentative at first, best friends at last. Sisters piled into the bathroom for conversations long missed. Husbands found their way to the kitchen table or in the living room visiting with Mom and Dad. Exhausted from travel, we all settled into the womb once more. I miss my parents deeply at these special times of the year. I miss that my children and grandchildren did not have enough of those experiences with my family. Oregon was just too far away. Distance didn't deter us from keeping the home fires burning. Mom and her daughters started writing a round robin letter keeping up on each other's lives with pictures, newsclips and other goodies making the rounds from Ohio to Indiana to Virginia to Oregon. My son decided that he wanted to keep the bond alive for the cousins since rarely did they see one another. For years the letter traveled from Oregon to Mom in Ohio to Indiana to Maryland to Colorado or wherever the cousin lived at the time. Mom loved the letters. They brought the family home again and again. My sisters and I now email instead of round robin. That ended when we lost Mom. The cousins still try to keep theirs moving. Once it was lost and a new one took its place. They struggle to keep the cousins in their lives in spite of their busy lives. The Loxley girls returned home again. Neighbors and relatives opened the doors and squeals rang again. Long visits over coffee and puzzles. Singing at the piano. Hugging and holding those we missed every day since we had moved to other places. We gathered around the table full of the bounty of the farm and the labor of Mother's hands. Dad blessed our meal and thanked God for these people we love. Neff Road you are in my heart this Thanksgiving season. If I try real hard I can still smell Mom's chicken roasting full of her wonderful dressing and homemade noodles boiling in rich chicken broth. Once more I am home. Can you hear me squeal? "Dear Pam, we are sharing some of our treasures this Christmas. Peg said she hoped you would keep the letters as she thought I didn't want anyone to read them, but I never cared. I never did anything I was ashamed of." The package was my parents' old love letters. The eight-year-old girl pointed to the boy in the field and told her mother, "I'm going to marry that boy some day." And, she did November 24, 1937. "July 22, 1930, Mr. Willard Loxley: I would be delighted to have you present at my 18th birthday party on Wednesday eve, July 30th at 8:30pm. Ruth Johnson"
Sweethearts who held hands, who kissed, who hugged, rarely fought and struggle through life's difficult times as one. "Hello, Honey. Was you disappointed when you didn't get a letter last evening? Well, I was so tired I couldn't hardly set up. I was going to write this morn but we loaded two loads of hogs so I didn't have time then. Mom said she was going to Bradford this afternoon so I told her to stop and give this to you. Gee, Honey, I sure am getting lonesome. I've been thinking about you all week. I been plowing so you see I have plenty of time to think, plan and build air castles. P.S. I don't know how I'll be able to stand being away from you until tomorrow eve. But I guess I'll have to. Yours forever, W.I. 1932"
The letters go on and on opening more windows into the love these two shared. This manly farmer wrote page upon page of his love for Mom. On some X's and O'x flow down the page in designs. The lived only a mile apart. Daily letters were delivered by their parents or siblings. This is the 74th anniverary of my parents' wedding day. The beautiful bride in blue velvet with cute strappy shoes and a lame' cap took the man in his handsome suit to be her own. Mom's family didn't go to the wedding. Her mother sat at home and cried with Mom's old boyfriend. Evidently, they didn't think that Willard was good enough for Ruth. Little did they know. Mom and Dad had a strength between that reached out to others. They didn't always do things right, but they tried. They tried to make a better world for so many others. They tried to live their faith. They were an example for those who had none. We had such a pride in these parents of ours even though it often felt like we girls were on the outside of such a strong love. Such love should fill a world. It did ours. "June 29, 1931: My, but I miss you. I just wish and wish I had you right beside me this minute - so I could confide all my little secrets to you. I really didn't realize how much I did depend on you until your gone. Be good and have a nice time. (Dad was on a singing tour.) Lots of love, Your Little Gypsy Sweetheart. Ruth Marie....Our moon certainly is beautiful tonight if you see it." Happy Anniversary, Mom and Dad. I know you are still holding hands in Heaven. They bake, they warm, they clean themselves. New ovens are a marvel to behold. A naked turkey can is basted, stuffed and poked with a timer that allows the oven to bake the bird to perfection. Ah, we've come a long way from when I was a baby. I sat in my high chair in front of the window overlooking the grape arbor. My grandmother lifted me from my seat as her mother looked on from her rocking chair next to the stove. It is a memory, only one of the three I have of my grandmother. A memory long ago etched in time and place. In 1907 my grandfather bought his bride a new stove. I know because I have the paperwork from the purchase, a receipt of order sent with a 2¢ stamp. This fancy new stove was every woman's dream. Wood was stacked behind it waiting to be tossed into the chamber that heated the stove. Delicious smells of food mixed with that of burning wood. Much different from what we presently have but a memory of wood smoke and a place to warm oneself on cold winter day. I'm not sure how the stove was delivered let alone carried into the house. I don't know what happened to this wonderful stove when replaced with an electric range. I do know that a turkey would have taken more than a few hours to cook, probably days. Grandad would go to the woodshed to cut pieces of suitable size to replace the burned logs keeping the stove hot and the pile of wood dry and ready. Probably a cast iron kettle sat on a burner adding moisture to the dry winter air. Clothing would be hung by the stove to dry. Boots tucked close enough to erase the rain. Vents from the kitchen to the upper floors would allow warmth to flow into the cold bedrooms. The stove was more than a place to cook. It was the hub of the house. And, probably in summer, used as little as possible. My grandmother's life was changed in 1907 as were the lives of other women living around Neff Road. The wood stove would later be replaced with electric. Oil lamps replaced by light bulbs. But the family gathering around the old stove would not be forgotten by those who lived then. This is a picture locked in time of a woman I did not know, but of a time I treasure of a grandmother, a great grandmother, a rocking chair and huge cast iron stove. The smell of burning wood brings me home. Riders on horses and in carriages traveled down the brick street. My feet walked the same street as those who lived there long ago. History beneath my feet. Downtown Arcanum. A step back in time. While in England, we visited Newark on the Trent. The ancient castle where King John died sat along what is now called the Robin Hood Trail. The small alleys and walkways as well as the main shopping area are cobblestoned. Stones laid, one by one, carried by man and horse creating avenues that last a life time. Mom and Dad went to Arcanum at least once a week for groceries. We ate at Husten’s, stopped at the hardware store, shopped at Ben Franklin's 5 & 10 and at Smiths. Main Street was paved with bricks that been laid by men who leveled the ground, hauled rocks by horse and wagon then laid them ready for horse then car. I love returning to that street. I delight in knowing that some things just don't change. Smith's has gone through many metamorphoses over the years and now houses a wonderful coffee shop. Ben Franklin still resides in the same location. The small pockets of rural Americana are precious. They hold our history just as the Newark Castle and cobblestone streets hold on to an older time, a time of my ancestors. Pockets of history painted forever in time by stone and brick, by manual labor and horse. I can't imagine that I would ever return to a city full of concrete and feel the same. Arcanum, you are beautiful just the way you are. Our house sat on a hill. Now this might not seem unusual to most people, but our part of the county was flat. Having a house on a hill was a bit out of the ordinary. Dad always thought that maybe the creek long ago had been a river that ran along the base of this hill. 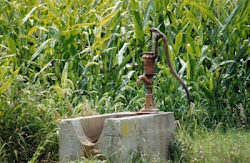 Perhaps it was a water line from an age when no one lived on this land. Whatever it was, it gave the house a lovely setting overlooking our friends and neighbors. I often talk about the lane, this long strip of gravel that saw the Loxley girls grow up. Doris and Victor lived across the road. Hollie and Margaret lived on down the road. The bridge sat across the creek the other direction. The lane saw us to and from the bus as well as giving us skinned knees as we traversed the gravel on our bikes. The lane took us to visit neighbors, to toss stones into the creek and to find our way to the news the mailbox held waiting. When the rains came, the water ran across the lowest part of the lane where it flooded from our field to Hollie's. It was difficult as a kid to walk down the lane at these times avoiding the mud puddles. They were deep and great for splashing. In the winter, they froze. We slipped and slid over the ice laughing and loving every minute of frozen wonder. Living on a hill was the best in the winter. Old sleds were pulled from the barn. Kids were bundled head to toe barely able to move. Down the hill and into the field we would fly. Popcorn balls and hot chocolate waited for us when we finally dragged ourselves into the house wet, cold and delighted. A picture postcard setting. A house on a hill surrounded by corn, surrounded by snow, surrounded in the past. Everyone should be so lucky. I know I was. "Cleaned up house and wrote a letter to Paul B. Visited school in p.m. Went with Willard, Keith and Margaret to P. Hill to basketball game. Both teams won G.11-17 B.15-20." Pages and pages reflect the life of my mother. Writing daily entries in date books began with her mother. Mom wrote until the end. Simple tracking of daily events. Funerals, weddings, visitors, haircuts, crops, daily happenings on Neff Road now give me insight into the life my mother lived. Perhaps it was the era she lived in, but in her date books and that of Mom Johnson, no feelings or observances are noted. I yearn to know more about these women and their feelings, but must be content with the simple, daily dialogue. Mom loved to play basketball, and I'm told she was a pretty good player. I can imagine my mother in her glory dribbling the ball down the court. Back then, and even when I was a teen, girls' rules applied. The team was divided at half court. Offense on one end. Defense on the other. It probably took all of Mom's strength to stop mid-court and pass off the ball to her team on the other side. Knowing Mom, she was in her element and thrilled. I guess in the simple daily writing my mother does show herself. I don't know Paul B., but I love knowing that Mom had a date with Dad that night going to the game with Uncle Keith and Margaret (not sure which Margaret). She was excited that FM had won both games by posting the scores. I like to read Mom's daily postings. It's as if we come together to share as I glean a bit more information about this woman. I learn more about my roots, what elements made up my parent's lives. My blogs are my journals to my children, my grandchildren. A history of where their story began will be more than an entry into a little book. This is story of me. Stacey, James, Peg, June, Kendall, Jessica, Brad, Trevor, Amy, Whitney, Joel, Jonathan, Meg, the list goes on. Mother measured the children. Upon opening the basement door, a row of names and years covering the door frame greeted you. The dates covered 1983 to 2000, the year mother died. Jonathan was a few inches taller than everyone else. Certainly this was a Lavy boy. Mother tracked 'her kids'. When going through the papers after Mom was gone, we found a sheet of names, dates and measurements. Evidently Dad had copied the measuring wall before the doorway received a new coat of paint. John Marshall, Jobi, Lorraine, Eric, Betsy, Stacey, Steve, Trevor, Sue Ann, Keith and Brad all stood against that wall between 1971 and 1978. Stacey was just a toddler. The list of names and numbers had no worth only memories more for the child measured than those of us reading the list. Although it reminded us of how much my parents loved the children who visited them. I'm not too sure how safe it was standing a teetering child at the top of the stairs looking down to the basement's waiting concrete, yet time and time again they stood straight waiting to see if they were a bit taller than the last time they stood in that same spot. I'm sure the wall has since been painted. I have the list and pictures of the wall. For this daughter, they remind me that fine decorating of a home should consist of a wall of dates and names, a stairway lined with hand colored pictures, counter tops holding handmade gifts. Mother and Dad recognized children. Not always their own, but they did acknowledge the worth and goodness in each child. I live in a rental, but I don't think that should stop me from taping a piece of paper on the wall to track these kids who visit this home. It can go with the wire strung across my stairway wall holding their painted pictures. Check out agrandparentsvoice.com today. I think you will enjoy the pictures. Like a sentinel she sat on the porch, Victor at her side. Doris didn't miss a thing. Over the many years of my youth, I played with their daughters and sons. It was another place I could call home. Marilyn was the only person I ever knew who memorized the Bible. She was a brilliant woman who lost her life in the mission field. Her family grieved, and I grieve with them still. Her older sister, Geneva, became the sister of my heart. When my father lay dying, she helped me to lift him, to tend to him, to grieve for him. And, wrapping her arms around me, we wept together. Merrill, Don and I played together for as long as I can remember. 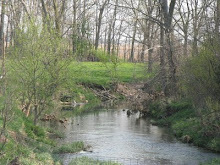 We flew across the barn on the swing, walked the creek, played baseball in the pasture. Lowell came later. Mom babysat for him, and he tagged along behind his older brothers. He became familiar face at our house. When the married Loxley girls came home to visit, the walk down the lane always began at Victor and Doris's house then to Margaret and Hollie's. I always looked forward to the hugs I received as soon as I crossed the threshold. Yes, I was home again. On one of my last visits to their house, Victor was very ill. Once again, it was his heart. I sat on the bed holding his hand, tears streaming down both of our faces. I begged him to be strong and not leave me. This gentle man had been a father to me. I could not bear to lose a second one. I kissed his cheek and went into the living room with Doris. We sat and talked. Talked of the neighborhood, talked of family. Conversation turned to the friction between my mother and I. "I knew they didn't watch you," she said. "But I did. I always did." Over the years she had kept tabs on me, and I never knew. I loved her even more. Age and illness has taken a toll as it does. Doris and Victor now reside in the Brethren Home. The last I visited we reminisced about good times and again, family. I sat absorbing these two people who mean the world to me. I want once more to sit on the stoop and visit with them. I want once more to run after balls in the outfield. These dear people are Neff Road. I close my eyes and return to their loving arms again. Just as sailors read the sky so too do the farmers. I grew up hearing Dad say, "Red sky at night, sailors delight. Red sky in the morning, sailors take warning." Dad was great with his quotes. We girls still repeat them remembering Dad. A tinged sky takes me back standing with Dad looking to the west at the beautiful red sunset. High wind warnings are in effect for our area. Last night I could hear their approach. This morning trees sway gracefully dancing together. I can't hear the wind. I try. I just can't hear it. Our wonderful farmhouse had old windows and a metal roof. We were comforted when the rain hit roof, lulled to sleep by the music it made. Old windows rattled when the wind blew and even a few of them whistled. Some storms frightened us as they pounded the house beating on it like a drum, shaking it like a rag doll. Yet the house had stood for over a hundred years. It wasn't going any place. Now I strain to hear the rain, the wind, the storms. Modern windows and walls, thick insulation, insulate me away from the sounds of nature. As I watch the wind whipping the branches of the trees I long to hear their music. New homes on Neff Road take the place of old. The sound of the wind is lost in silence inside those walls. The comfort of the rain upon the roof is lost to another generation. Folklore tells us that a ring around the moon signifies bad weather is coming. I don't know that Dad knew that ice crystals covering the halo signifies high altitude, thin cirrus clouds that usually precede a warm front by a day or two. A warm front that can signify a storm. I found out that it is believed that the number of stars within a moon halo indicate the number days before bad weather will arrive. A halo around the moon influenced the farmer in our house. A halo that fascinated his little girl and in the future would warn her of coming storms. Sometimes I open the door and listen. Listen to the past and the present. "Red dog at night." Am I hearing a voice from my childhood or are we still sharing precious moments, Dad? "Get Your Paper. Get Your Morning Paper." "Get your paper. Get your morning paper." Newspapers were hawked on street corners in the cities while on Neff Road we waited for our weekly paper. Down the lane one of us would go to pick up the morning paper. Dad would take the car down to retrieve it when the weather bulked. The paper was dissected page by page. We also received the Dayton paper, but the Advocate was 'our' paper. My oldest sister at one time had a subscription to the Advocate. The news was a little old by the time the paper appeared in the mailbox in Pennsylvania and later in Washington, DC. Our true local newspaper was Mom. She caught us up on all of the births, deaths, property sales, weddings, etc. She was a great 'newspaper' because we got the gossip as well. Our link to our roots was severed when Mom died. Now I read the Greenville Advocate every morning. The current news pops up on my computer screen. I scan the paper for pictures and news of old friends. I wish for more news and less sports but such is the way of Darke County and probably much of Midwest rural areas. It concerns me that there is little, if any, national or world news. There is a birthday page full of pictures of small children. In a world teeming with child predators, I wonder why the paper isn't protecting these children instead of posting pictures with parents names and place of residence beneath. Syndicated columns fill pages for lack of local news. The paper is trying to change, to evolve, but has a long journey ahead. Mom had at one time back in the 60's taken me into the Advocate office to meet the editor. At that time I was considering a future in journalism. However, nothing inspired me to take up the career. Had someone captured my imagination and potential, I would probably have embraced that future. Yet I needed my own journey to take me to the writing that was my own voice. I don't go to the Advocate to be inspired. I go to it in order to keep the Loxley girls informed of the changes in Darke County. That local paper is at my fingers tips. It doesn't get wet in the rain or line a bird cage when I finish reading it. Yes, I do subscribed for a nominal fee paying for I pay that opportunity to look through a window at Neff Road. My mornings start with the Greenville Advocate. Gee, Mom, I miss the gossip that goes along with the news. Had I gone into the house blindfolded, I would still have known Pop and Mom's house. Pop smoked a pipe. The wall, curtains, carpet, everything held onto the smell refusing to give it up no matter how well my grandmother cleaned. The scent of honeysuckle always takes me back to the front stoop where it grew with wild abandon. My friend and once neighbor, Geneva, lives there now with her husband Roy. When now I enter the house, scents of the fruit cellar, the pipe and my grandparents remain. The nose. It unexpectedly captures memories, moments in time, people, locations. Grandad's house smelled of grapes, the wood bin and work shoes. We came into the house through the mud room. Outside of the door the wooden arbor groaned with the weight of the grapes. The Loxley girls always knew when they were home as soon as they walked into the house. The smell of our nest. I'm not sure what made up the smell of our home, but my children noticed it as well. The scent of our past. She walks through the door. "Your house smells good, Grammy". Gabby goes on to explain how she loves the way my house smells. Thank goodness it is a good smell. Will it be one she remembers the rest of her life? Scents. They recall, they take us back, they stay with us. I know this is an odd topic, but I'm curious if anyone else has similar memories. The girls who went to school with my son would snuggle up to him. "He smells so good." It is a scent that reminds me of my father. Is there a scent that belongs to a family? Animals know their own by their scent. Do we know our own by a scent? Ah, the nose. Wish mine was smaller. I love the story you posted on "A Perfect Row of Rocks". When you wrote about running to Granddad's, I was reminded that we children could run to any house on our road and know we had instant help. I remember when you were born but didn't realize I was 9 years older than you. Argh! Thank you for writing. I hope others will read your story of Neff Road. Sometimes online research takes a great memory and slaps it down. Well, the memory is still here but no longer the building that burned February 2008. Once in awhile when riding with Dad in the truck, we would stop for lunch at Joyland. Joyland., an old restaurant that wouldn't draw tourists. People who didn't know the secret would probably drive looking for another place to eat. Yet cars packed the parking lot. As with other beloved old restaurants, no one paid attention to torn seats, mismatched dishes and carpet a bit worn. No, comfort food drew us back time and time again. When the Loxley girls returned for a visit, they packed up their children for lunch at Joyland. The favorite of a small child sitting with her father became the favorite of her children. Pork tenderloin sandwiches dwarfed the plates on which they were served. The bun became a place to hold on to as you ate the two inches or more of meat that hung over each side. It was a sandwich that would feed a family of four, and it called us back time and time again. We didn't have the tree lighting in Time Square or city lights lit for the holiday season. But we had Ludlow Falls, the home of Joyland. It was about Thanksgiving or maybe later when our family would pile into the car heading to Falls. Colorful Christmas lights were strung behind the falls reflecting through the frozen ice. Decorations framed the site, and we smiled, held hands and welcomed a new season. Cold bodies were warmed by hot chocolate and tenderloin sandwiches. Family memories were made once more. I started to write this blog remembering Ludlow Falls and the greeting of the holiday season. Now that I know Joyland is gone, I write in memory of family restaurant...our family's. Ah, Joyland, I will miss your tenderloin sandwiches. The huge flat rocks laid in a row along the west side of the barnyard. Tall pig nut trees (at least that is what we called them) resided over them creating a perfect place for little girls to play. Brenda would take one rock for her house and I another. We could down the row of rocks pretending to shop in 'rock' stores. Rocks big enough to hold us and our dolls were big enough to fit our imaginations. Dad went through a phase after he retired from farming making changes to the farm. The old garage was torn down. The old barn that at one time held my horse and the sheep was torn down. The fences were all taken down. The site of the old garage became more grass to mow. The old barn site became a large garden. Fences torn down made fields just a bit larger. Dad was on a roll. One day we came home from shopping in Greenville with Mom to find Dad and our neighbor Carl who was up on the tractor with the loader, digging out our rocks...our little houses. Yes, I was in my 30's, but they were still my rocks. My sisters were equally upset that Dad had not consulted anyone else in the matter. Dad continued the digging; Carl shaking his head. I wanted the farm to stay the same. Living away for so long, I needed to go home to nest in what I knew. Dad was bored and always needed something to do outside, to be active. He didn't see the farm in the same way as did his daughters. I miss those big old rocks. I wonder how such large, flat rocks had been moved to this straight line across the west boundary of the barnyard. Certainly, it wasn't random placement and must have been moved to this location by horses. There were no other huge rocks like these in the area. Were they a boundary of a camp for those who made the arrowheads on our land? Did people grind grain on the rocks? Were they used in the foundation of something more? Did they come from a river that was now a creek? Carl buried the rocks. The holes were at least 4' deep and as wide. Dad continued to bury things. We figured some day we would come home to find Mom in a hole up to her neck because Dad couldn't find anything else to bury. They were just rocks. Just rocks. Weren't they? This is a graphic story about a rather repulsive experience involving the birth of a lamb, but it is necessary for me to tell. It is my growing up. Please feel free to skip this blog if you feel uneasy in reading it. They pushed, they prodded, they stood back looking for new solutions. No matter what they did, she didn't move. Before they had walked down to the creek bottom, Dad explained that the ewe would die if she didn't get up. He knew since sheep sometimes just go down and die for no reason other than what he considered stupidity. Little did I know that when Dad opened the door of the truck that cool morning in spring many years before that the two adorable lambs peeking out at us would teach us hard lessons. As I've mentioned before, a mother sheep will sometimes not accept a lamb and will often hurt the baby, if it is not removed immediate. Thus, my bottle-fed baby, Pamper. How could a mother turn away from her baby? This little girl struggled to be a good mother to ths lamb who begged for the warmth of another. How could a mother turn away? One of the ewes was about to give birth. It was an event. Brenda and I had often sat in the field watching a cow give birth. Always, it was an exciting time. Now, I sat in the corner of the pen while Dad and, I think my sister, held the ewe trying to calm her. There was a problem. Our neighbor, Hollie, was called to help. We girls quietly sat aside wanting to leave but yet glued to the spot. The lamb was born. In the process of birthing, the ewe had pushed out her uterus. Nothing was to be done but to push it back and have the vet stitch her. She would not live. I was but a small child, and it was the way of the farm. "We can't just let her die." My son and nephews were intent of saving the ewe who refused to get up. They went to the creek bottom to save her only to find that she would not cooperate. Two legs would be pushed up. As they encouraged the other end of her to also stand, the legs already standing would go down. Discouraged they returned to the house visibly shaken. They could not save the ewe despite their efforts, their sweat, their tears. It was the way of the farm. Yes, I was exposed to things that most kids cannot imagine. I learned about birth, about death, about trying, about disappointment. Maybe more than anything, I learned early the cycle of life and the beauty it held as well as the horror. I am a farm kid. It was the way of the farm on Neff Road. Religion was not apparent on Neff Road. In fact, I don't think I noticed religion as I was growing up. I went to school with kids from the Mennonite Church, German Baptist, Brethren, Methodist. There was no religious tension, there was no recognition of religious differences in any way. We were a community of people. I think the only time I really noticed the difference was when the German Baptist kids dropped out of school in the 8th grade. They began their adulthood early. We missed those friends and never saw much of them again until they were grown and married. Some of us weren't supposed to wear make-up or dance. Some of us did in spite of the rules. Some went to Bible study. Some did not. Some were deep believers and some were not. Our family life may have revolved around the church, but our community revolved around friendship and family. We all dressed the same except for the German Baptist kids in homemade clothing. No one would ever think to tease the kids, because they were our neighbors. Leather jackets made a bigger impact. Long hair, greased back hair made more of a separation. We went to ice cream socials at all of the local churches. I went to the Painter Creek Bible School then off to West Grove for theirs. Our friendships grew from the farm life we lived, not the around religion. Sure we had our differences, but as a kid, I never noticed. All the churches were part of our lives. I wish the world was more like our little corner of the world on Neff Road. Acceptance: another reason we called Neff Road home. "You-s aren't from Wisconsin." "You aren't from Oregon." How did they know? Time and time again for years I was asked the question, "Where are you from?" So we said crick instead of creek. Read-up instead of clean up. We put 'up' behind a lot of words: packed up, hurried up, washed up, finished up, etc. Mowed yard instead of mowed grass. Sick-in-bed instead of ill. Many phrases that other parts of the country don't use. I read a great deal and discovered that some of our terms and words stem from Scottish roots. I have also learned that it is a language characteristic of that small part of the country. No, I didn't say as they do in Wisconsin: bubbler for drinking fountain, hairs instead of hair, ooot instead of out, etc. In Oregon, I don't say: perduction instead of production, coulddent instead of couldn't, etc. Every part of the country has language quirks. I seem to have lost most of my Neff Road brogue. I am no longer asked questions regarding my birth location. I love to go home and hear it again. I don't know of any Scottish roots in Darke County, but the origins of the language do peep through. We are a country of many origins. Some of us wear them on our tongues. My son is getting married in January. My house had been the designated location to receive gifts that will be mailed or shipped. I threaten to open them, shake them and listen for anything scratching or ticking. Not much for me to do, but I love being involved in this step into their new life. It takes me back to 1969, when I was married. Gifts were delivered to the farm and at the wedding. We decided to open the gifts after we returned from our honeymoon in Florida. Mom had the ping pong table in the basement covered with packages. Family was invited to join us as we sat down to the task of paper and ribbon. Gifts varied as much as the guests who were invited to the wedding. A touch of the 60's presented itself in color and design. Table cloths and handmade linens piled high. Champagne and ice buckets, silver plated serving pieces, Fostoria and Fenton glass, a set of antique Depression glass goblets, place mats and napkins, a crystal ash tray, a crystal vase, a variety of gifts filled the room. People bought what they could afford or choose one of their precious pieces wanting to give Willard and Ruth's daughter the best. Each and every gift was a treasure. A few registered pieces were received, but most were gifts representing the relatives, church members, neighbors and friends. Our cabinets would be full and the linen closets bursting. People who had started their first homes with items they made or treasures handed down to them, gave gifts from their hearts. Some of those gifts still reside in my home. Many wore out or were broken. Yet the memories are here of those eager to give those newlyweds a good start. Giving of gifts seems mechanical now. We shop online or go to the registry to check off one more item. However, when my daughter was married, our dear neighbor, Margaret, gave her a vase that my mother had given her on her wedding day. Those who gave gifts to us gave to me long before I was standing there on my wedding day. The true gift was the giver. Pop, my maternal grandfather, painted the roofs of his buildings red. Ownership and pride were reflected in that red paint. Who knows where the red roof tradition began. Perhaps with my great grandfather or before. No one knows. My cousin, Gene, took over my grandfather's and my uncle's farms. 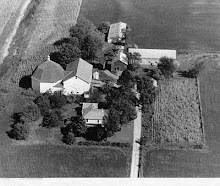 He continued to purchase more adjoining farms soon owning many acres of land. Yes, he loved to farm and loved the land, but there was more. He provided homes for his family. His daughter lives in the house where Gene was born. His stepson, before his death, lived in another one of the farmhouses. Even this stepson's ex-wife was given a little farmhouse, a home Gene provided for his grandsons. The roofs were red. When my father died, a decision was made to sell the farm, a decision difficult for my mother. Gene bought the farm giving my mom her home until the end of her life. He was an honorable man believing in family and their protection. A man not given to show of emotion he gave the only way he could. The landscape around Neff Road is dotted with red roofs, dotted roofs that represent my family and a generous spirit.